The key to successfully completing a project is having a clear definition of its scope from the start. That means defining the exact work that is required and then performing only that. In reality you are always faced with changing circumstances no matter how well you plan. Only by carefully controlling such changes will you avoid disruptions and delays. The planning of your project scope starts with understanding exactly what each stakeholder’s requirements are and getting his or her approval and sign-off of the final scope. Time spent at this stage and ensuring stakeholder agreement will greatly reduce the costs involved in having to make unplanned changes to the project scope. Now is the time to document any assumptions and constraints involved in the scope, then circulate them so that stakeholder expectations are clearly set and can be managed. Once you have the high-level description of your project you begin to break it down into manageable and practical chunks of work (WBS – work breakdown structure). Each package of work has to reflect the way it will be performed so that costs and time can be accurately estimated. This then enables you to produce the schedule of work where you can show the project path dependencies. This is incorporated into your scope management and project plans. As each package is completed it can be presented to the end user for formal acceptance. As the project progresses it is inevitable that some changes will have to be made e.g. change in regulations, or alterations needed as a result of testing. Therefore it is essential that you have a clear procedure that everyone understands how to define and present a change for assessment. Without such a procedure you could find ‘scope creep’ or ‘gold plating’ occurring. Changes can gather their own momentum building up incrementally like ripples in a pond (scope creep) and cause horrendous problems often resulting in failure. The other threat to success often comes from within the project team itself. Individual members feel it would be perfect it the product offered ‘X’ raising its quality, but that person may not be aware or understand the full implications of what they see as a ‘minor’ change (gold plating). 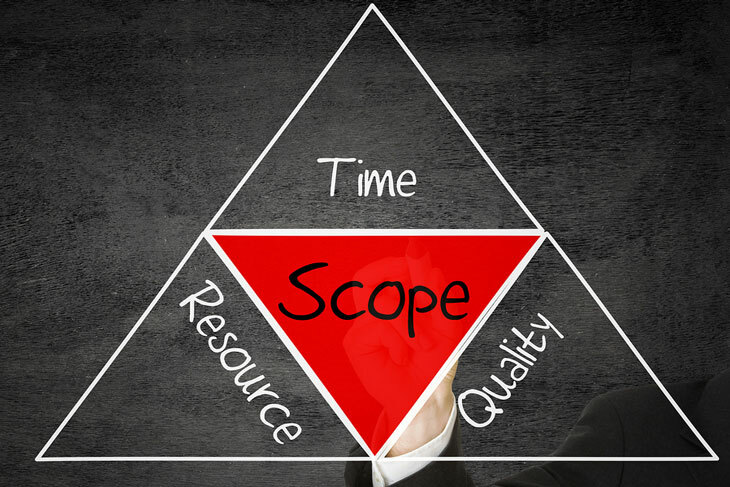 This free eBook explains the processes and requirements involved in scope management. Any planning or work activity which is not directly focused on completing the specified project objective represents a waste of resources and should not be undertaken. Many projects fail because of difficulties in trying to control the scope of the project. Defining scope is an exercise in fact finding, documenting and gaining agreement about what needs to be done and how. It can be difficult to get sufficient face time with stakeholders to achieve consensus about the exact scope of the project. Scope needs to be constantly monitored to avoid it changing in a way that will break the budget or timescale, or will contravene stakeholder’s expectations of the final deliverable. Project sponsors and end-users may not have got everything they wanted included in the initial project specification and use the ‘requested change’ route to incorporate elements that were not included originally. Project team members may believe that adding incremental improvements during the course of the project will create a better solution without increasing risk or cost. Managing project scope is an ongoing process because stakeholders are often tempted to increase the project scope via the back door once the project gets underway. Scope creep and gold plating can become intertwined when end users and developers get together because both see their interests aligned in producing something that goes beyond the agreed functionality with perceived minimal risk. The reason for an effective scope management system needs to be made clear to everyone on the project team.